First, we need to create a new QuestionRepository interface extends from the ReactiveMongoRepository interface to manipulate with the MongoDB database. You can see more the tutorial Reactive REST APIs with Spring Data MongoDB Reactive and Spring WebFlux for more information. Next we will configure the connection to the MongoDB server. OK, everything is ready, now we will go to the main part of this tutorial! With this declaration, I expose the APIs to the Core Question Service with the request URL starting with “/question”. 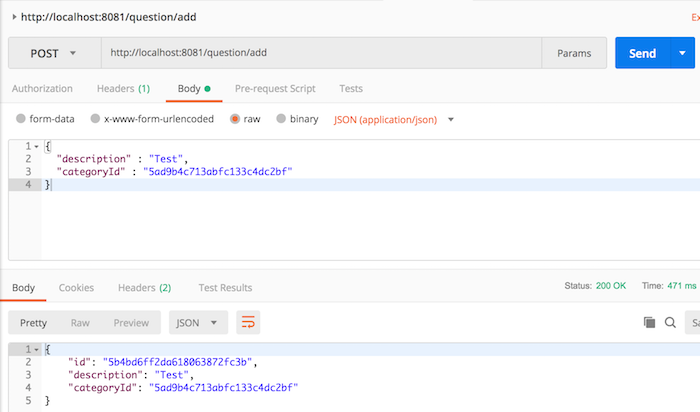 Now that we’ve finished building the API for adding a new question for the Core Question Service, let’s test it out. I will create a new class called QuestionControllerTest located in the src/test/java package to test the QuestionController class.